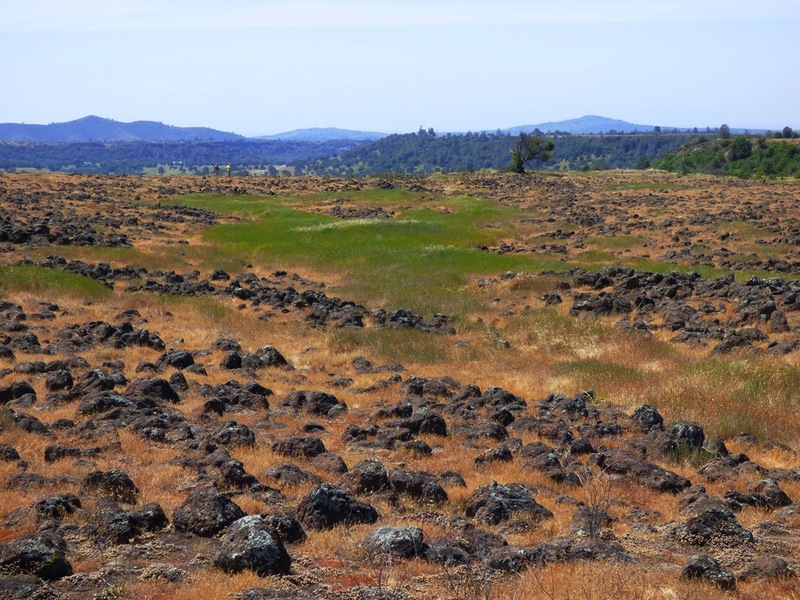 Around 10 million years ago, a lava flow surged from a volcano near present-day Sonora Pass in the Sierra Nevada. 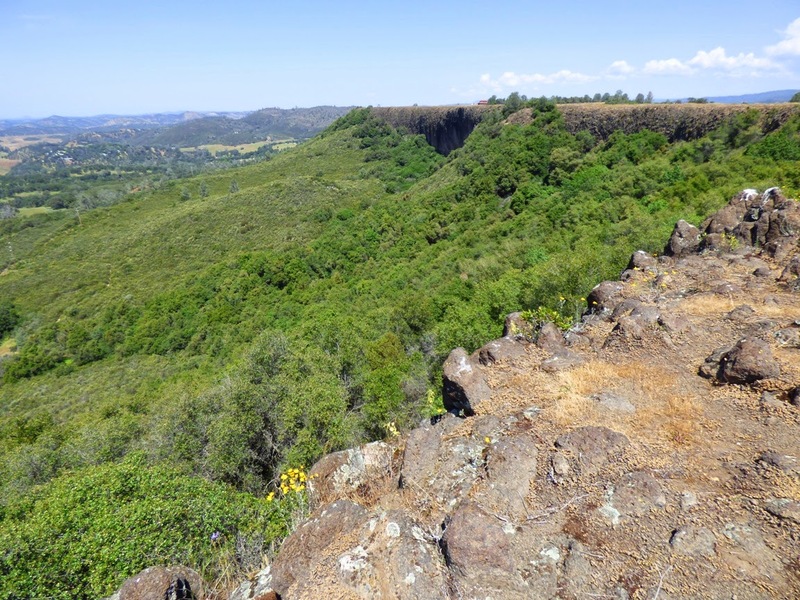 Composed of latite, but non-viscous like basalt, it flowed off the volcano and into the channel of the ancestral Stanislaus River, eventually flowing close to sixty miles. The river eventually eroded another valley and the lava flow was left relatively intact. 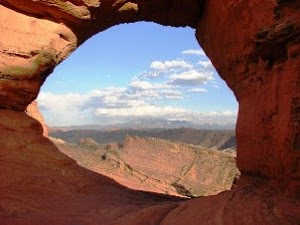 The Sierra Nevada rose and tilted westward, and erosion removed the surrounding softer rock, leaving the former river valley as a ridge several hundred feet high. 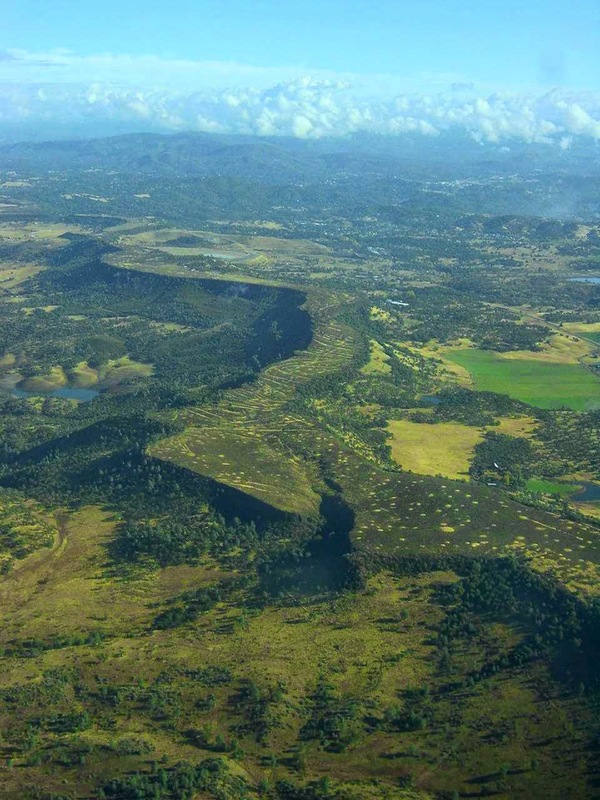 This was the origin of the Stanislaus Table Mountain, an inverted stream. 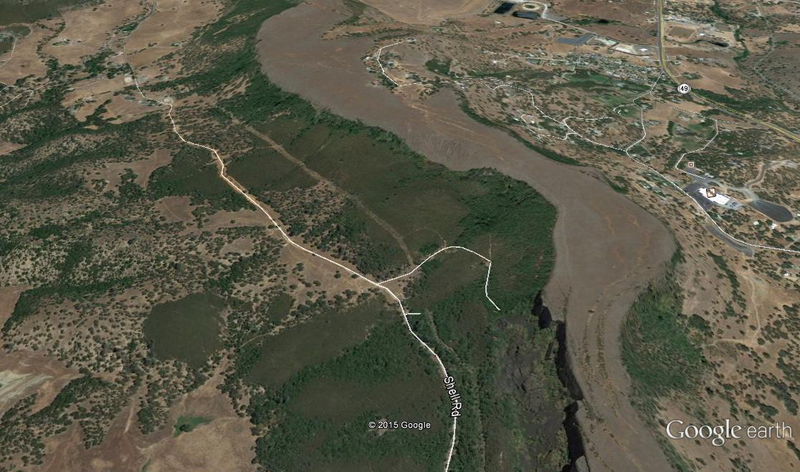 In this GoogleEarth image, the trail mostly follows the white line along the base, and then climbs the forested slope on the right. 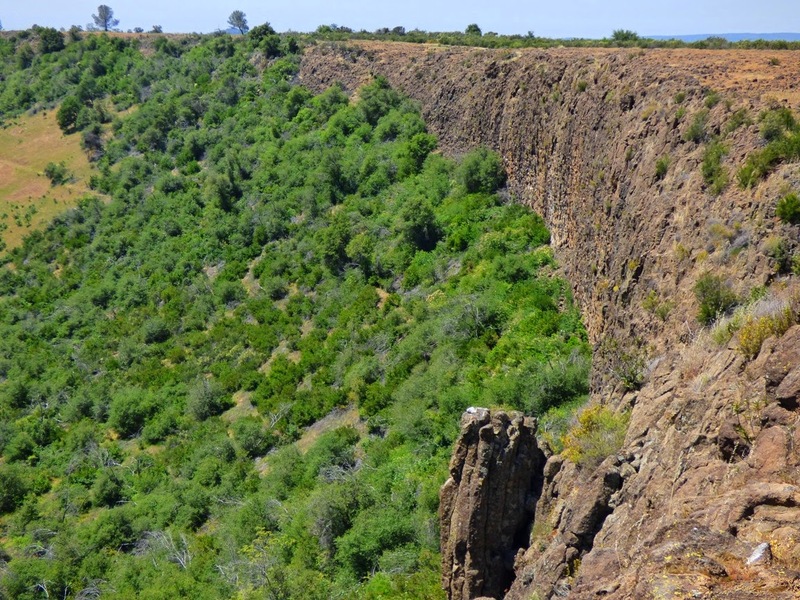 Table Mountain forms a mesa-like ridge around Sonora and Jamestown in the Mother Lode of the Sierra Nevada. A lot of it is on private property, and as such is inaccessible for close investigation. 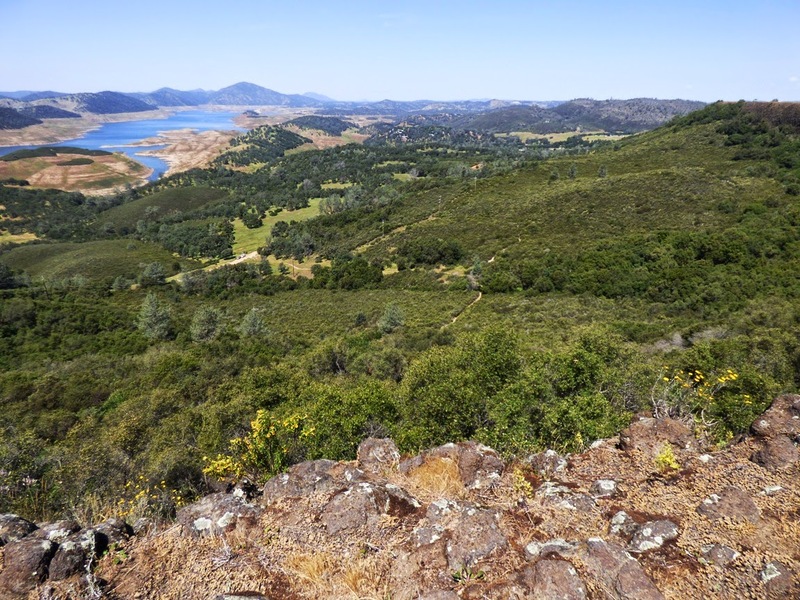 But one portion lies within the boundary of the U.S. Bureau of Reclamation lands around New Melones Reservoir. 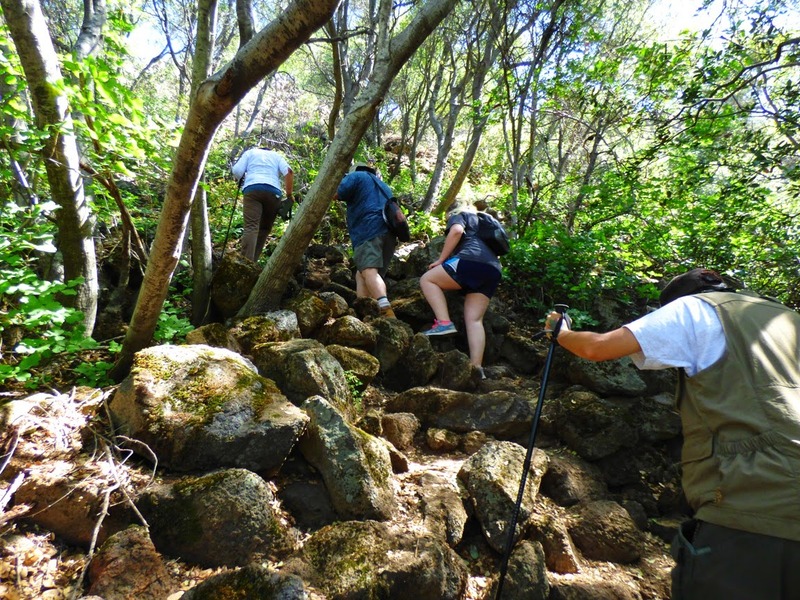 The Bureau has constructed a trail to the summit, and that's where we were headed today on our Geology Club hike. 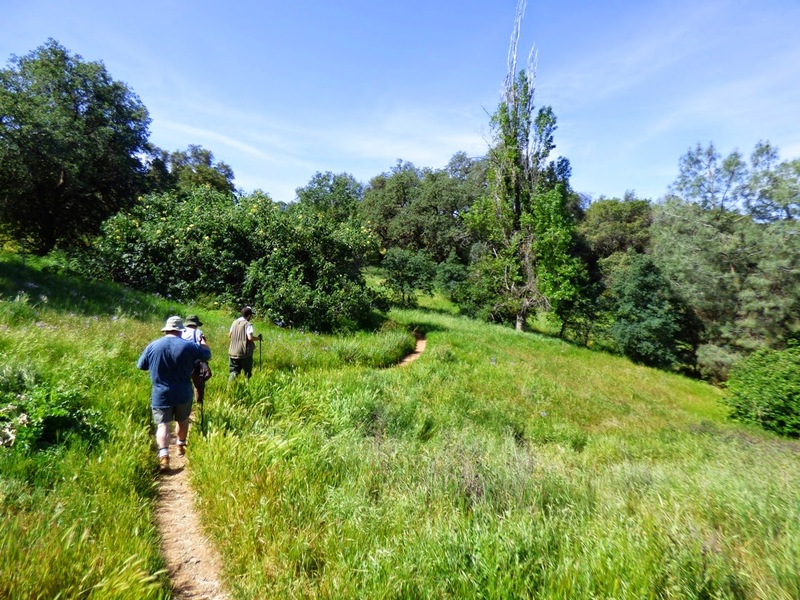 The trail is about 1.5 miles in length, and the first mile is a gentle grade through meadows and oak woodland. The grass was still green and wildflowers were reasonably abundant, but it isn't going to last. The soil felt bone dry, crunching under our feet. It's going to be a long, hot summer. For the last half mile, the trail becomes increasingly steep. 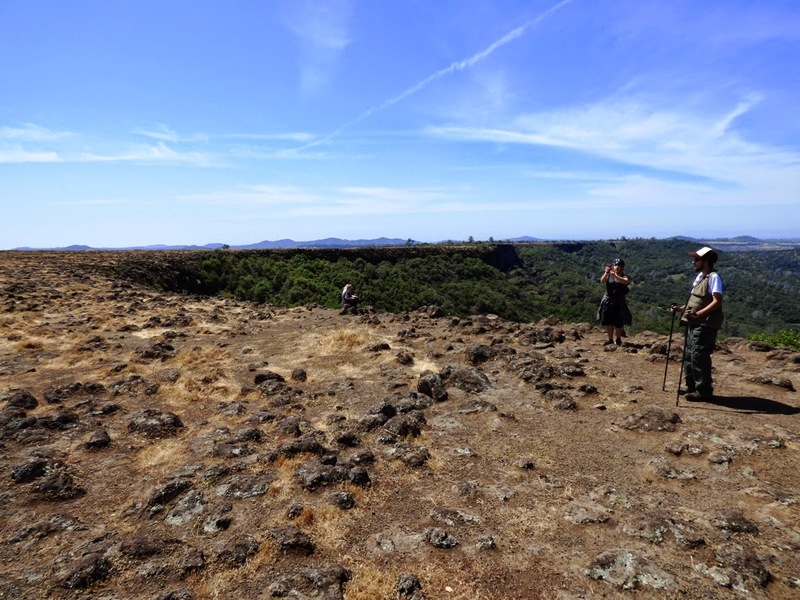 It's a climb of several hundred feet to the top of the lava flow. It was hot today, nearly ninety degrees, and I was appreciative that our trail was on the shaded north side of the lave flow. Oak trees provided shade, but also obscured the view but for a few choice moments. The view provided us with confirmation of our progress up the mountain. But near the top the trail became a near scramble up the rocks. 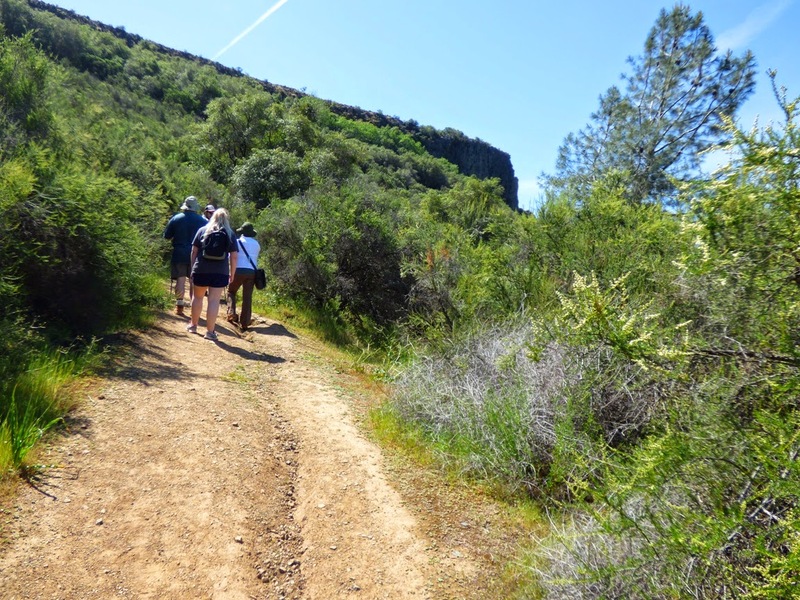 The short-cuts of use were hard to distinguish from the actual trail, as both were so steep. The scramble was short, however, and we broke out into the barren surface of the top of the inverted stream. It was an alien landscape. Alien in the sense that it was covered mostly with actual native vegetation, unlike the grasslands below, which have been taken over almost entirely by European or Asian invasive grasses. The invasive species cannot compete in this harsh, mostly dry habitat. It was most certainly dry on this day, as we have had few rainstorms since February. 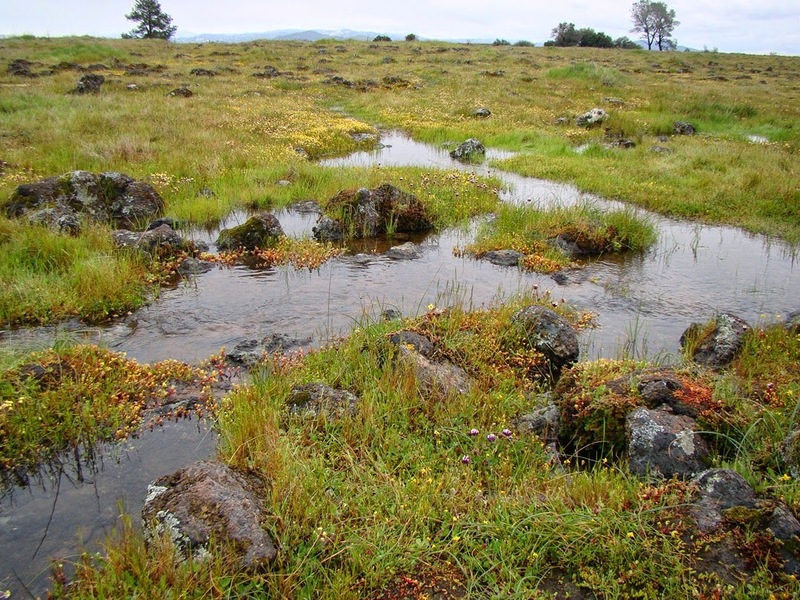 These rocky flats sometimes contain vernal pools and swales, and constitute one of California's rarest habitats. This section of the flow is one of the only protected portions of this type of landscape. The pools exist for only a few weeks at a time in the winter and spring seasons. At least one of the flower species here is found nowhere else in the world. 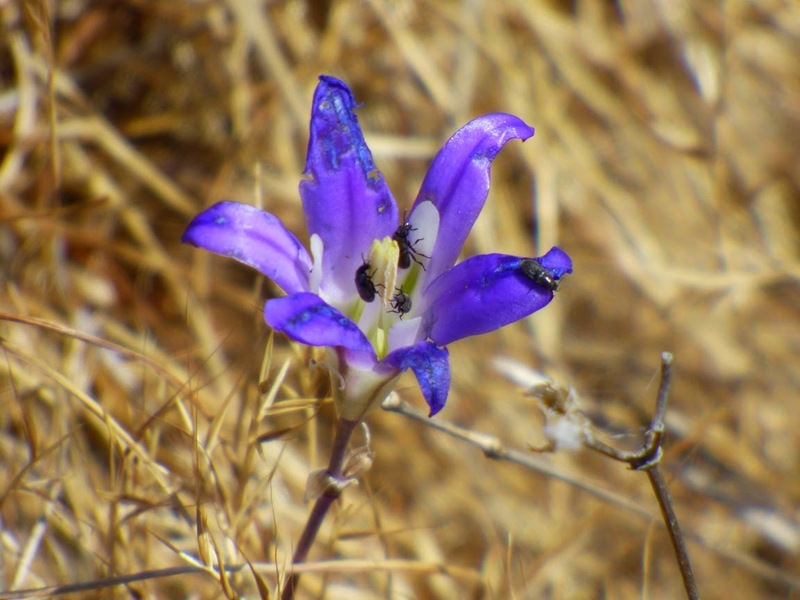 In spite of the intense dryness, a few flowers persisted here and there, including on the shaded north slopes. The top of the flow was a fine lookout for views in all directions. The cliffs drop off steeply on both sides. The local casino lies directly below, and the abandoned open pit Harvard Mine lies just to the east. To the north lies the nearly dry New Melones Reservoir. 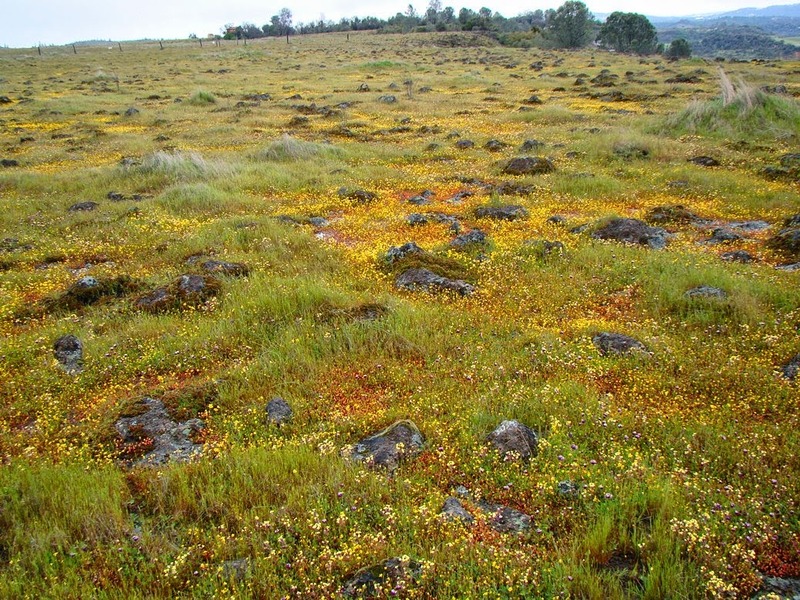 It's a strange and wonderful environment on top of the lava flow, one that is quite different than any found elsewhere in the state. We explored the summit area for awhile, had lunch and started down the trail back to the road. We visited Table Mountain in an entirely different time back in 2011. We arrived in a wet year, and hot on the heels of an overnight rainstorm. It's hard to describe just how different the scene was on that trip. 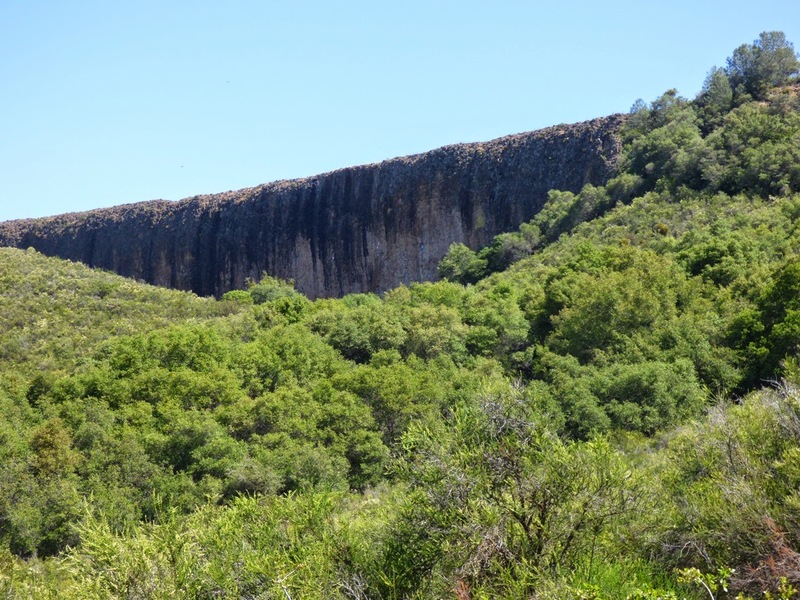 There were pools and rivulets all over the summit area, and hundreds of small waterfalls cascaded over the cliffs. Flowers were everywhere. It was a totally different experience. I will have to move to california and signup for your class. Amazing stuff. Wonderful post yet again, Garry! Your descriptions and photos are so intriguing and educational. Such a contrast between a wet year and the current terribly dry one. Unique. 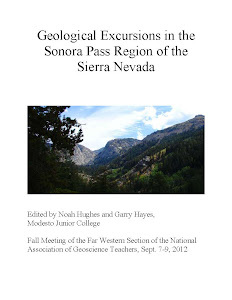 Thanks so much for sharing your love of geology and more.